These were the theme days during DiscoverU 2017. Today’s your chance to dive into a question students often ask during lessons: “Why do I need to learn this?” Show students how what they’re learning can be applied to future careers. For example, if they are currently taking algebra, you might want to demonstrate how it is used in carpentry, architecture, or engineering. Also important is describing how educational pathways lead to a particular job. 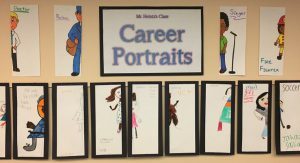 You could feature one career each day of the week, or even the rest of the school year! 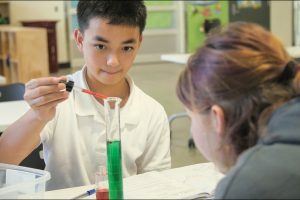 Help students explore the science, technology, engineering and math (STEM) careers available to them in the Puget Sound region. Researching cures for disease, keeping drinking water clean, designing video games and building new roads—these are all jobs that require an education in science, technology, engineering or math (STEM). Support student exploration of Puget Sound STEM careers today. Show them the most interesting and cutting-edge STEM jobs in the region, introduce them to young professionals working in this field, and help them figure out what skills they need to excel in the STEM fields. 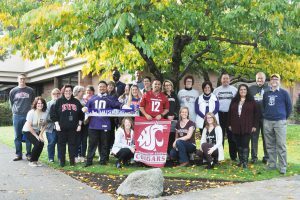 Today, promote a college-going culture by wearing your school’s gear and talking about your college experience! What school(s) did you go to? What did you study? What were your favorite college memories? Did you live at home or on campus? Make them aware of the various education paths they could take, including technical training programs, apprenticeships or two-year colleges.For older students, use this opportunity to focus on aspects of the college going process like applying for financial aid or talking to them about the transition beyond high school. Today, we honor our on-the-job heroes. They can be anyone, from an everyday hero in your life to a hidden figure in history. On Community Heroes Day, showcase careers of your school’s alumni, local community heroes, or hidden figures from history. This is an opportunity to support students in thinking about who inspires them and why. From everyday heroes like the electricians and plumbers who make your house warm and comfy, to people that have pioneered their fields like Mae Jemison, the first woman of color in space, or the Gang of Four that helped lead Seattle’s Civil Rights movement. When students look into their futures, what do they see? Set up a fun a photo booth for students to cap off DiscoverU week! It’s the last day of DiscoverU week, and today you can help students transport themselves into the future and envision where they want to be. Students can create time capsules, write letters to their future selves or pose in a Flash Forward Friday photo booth. Schools around the region are setting up photo booths for students to take fun photos with DiscoverU swag to cap off a week full of career and college exploration. 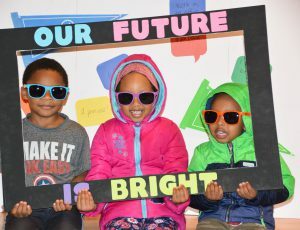 We want to see what the region’s students have in mind for their very bright futures!